Finally… the Red Skull returns! Not only does Captain America’s greatest foe resurface in this issue, but he’s working with AIM (no longer being called Them), and he gets control of their new weapon: the Cosmic Cube, making its debut in the first issue of this storyline. …in which he’s concerned with predicting civilians first and foremost, as usual. The problem is, no one else sees Cap’s attackers, and they think he’s a little… troubled. Not the last time the public would lose their faith in Captain America, but probably the least significant. On the next page, we see who is responsible… well, it’s no surprise after I (and the cover) gave it away at the top of the post. The Red Skull recounts his final battle with Captain America—shown in Tales of Suspense #72—during the fall of Berlin, and how he managed to survive under the rubble of Hitler’s bunker (with his two loyal aides here), kept alive and young by an experimental gas (later revealed to have been developed by Arnim Zola), until they were found by AIM, who the Skull agreed to work with. Before Cap returns, let’s take a glimpse at the Cosmic Cube—definitely not as impressive-looking as it should be, despite some Kirby-esque wiggly bits (and some eerie coloring from the anonymous colorist). When we next see Cap, he‘s mingling with the public in an effort to reassure them of his sanity. 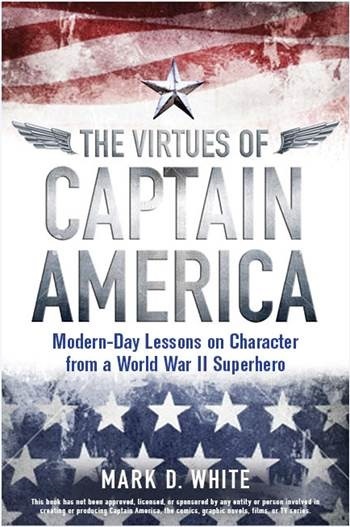 He signs an autograph for a veteran’s son and asks him about his own service—which Cap does with every veteran, widow, or widower he meets, out of respect and humility—when one of the Skull’s thugs approaches, using his mind control device to hide himself from everyone (including Cap) so he can shoot the civilian and plant the gun on Cap. This is how the Red Skull often tries to defeat Cap: not by simple physical destruction, but by discrediting him with the American public, striking a blow against democracy and freedom as well as Cap himself. But Cap has taken precautions, having S.H.I.E.L.D. put a mind control “jammer” under the A on his cowl (“this A doesn’t stand for manipulable!”), and once the thug is beaten he reveals the mastermind behind the plan. Again, Cap references his destiny, chosen for him, and implicitly denying his own role in determining his fate—consistent with his existential musings in issue #75, covered in the last post. In issue #80, Cap rescues an AIM agent trying to stop a renegade colleague—the Keeper of the Cosmic Cube—from taking the Cube to the Red Skull. Cap uses the S.H.I.E.L.D. status Nick Fury granted him in issue #78 to get his very own missile to help him apprehend the Keeper, and executes one of my favorite Cap moves: jumping from a flying object (usually a plane, but a missile works just as well), always an effective way to show his courage. While fighting the Keeper once on the ground (after being temporarily blinded by a gunshot that barely missed his eyes), Cap is reunited with the Red Skull. Perhaps inspired by his brief spell in therapy, Cap uses psychological tactics on the Skull, trying to get him worked up with some old-school trash talk. Unfortunately, the Red Skull sees through Cap’s tactic and turns it against him, hitting him where it hurts the most: Bucky’s death, which triggers not only anger but also Cap’s latent hunger for vengeance. After subduing Cap with gas, the Red Skull gets the Cosmic Cube from the Trapper Keeper in the final page of the issue, and Cap realizes how bad the situation is. Issue #81 opens with reminders, both of the Red Skull’s newfound power and Cap’s lack of concern with his own life in face of the doom facing countless others. First, let’s make a mud guy to attack Cap! Cap is about to finish the mud man when the Skull makes his creature vanish, admitting that he can’t bear to have him defeated, then uses the Cube on Cap directly, prompting some quick and drastic thinking from the Sentinel of Liberty. Again, subterfuge is not usually in Cap’s toolbox—he loathes dishonesty, even when strategically useful, but does use it when the situation is dire, as it definitely is here. And he appreciates all too well the Skull’s vanity and, as we see in the last panel above, his sense of poetic justice, having his greatest foe and the symbol of all he hates serve him. After making the Red Skull overconfident, Cap attacks and tries to wrest the Cube from his hand. Even though the Skull wills the island they’re fighting on to split under their feet—instead of, you know, wishing Cap to disappear, turn into a duck, or never to have existed—Cap uses one final blow to knock the Cube out of his hand and into the water below. The weight of the Skull’s armor pull him deep under water where we would assume he died. And the Cube? Also lost (until it surfaces in Avengers #40). At least we get some stirring final words from Cap—and what a pose in that final panel.